Takes 45 Minutes , serves 8. Cook one cup of brown rice as directed and set aside. Heat a large cast iron skillet on medium-high heat. 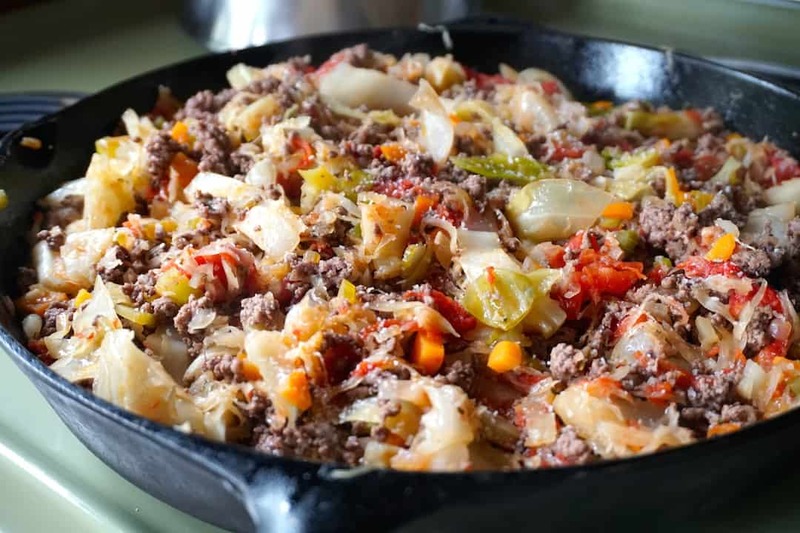 When the skillet comes to temperature, add the ground beef, breaking it up as it browns and cooks in the pan. Transfer cooked beef to a paper towel-lined plate to remove the fat. Wipe the fat out of the pan before returning it to the heat. Add the olive oil to the skillet and when it’s shimmering, add the onion, garlic and cabbage. Reduce the heat to medium, stir, cover and cook for 5 minutes. 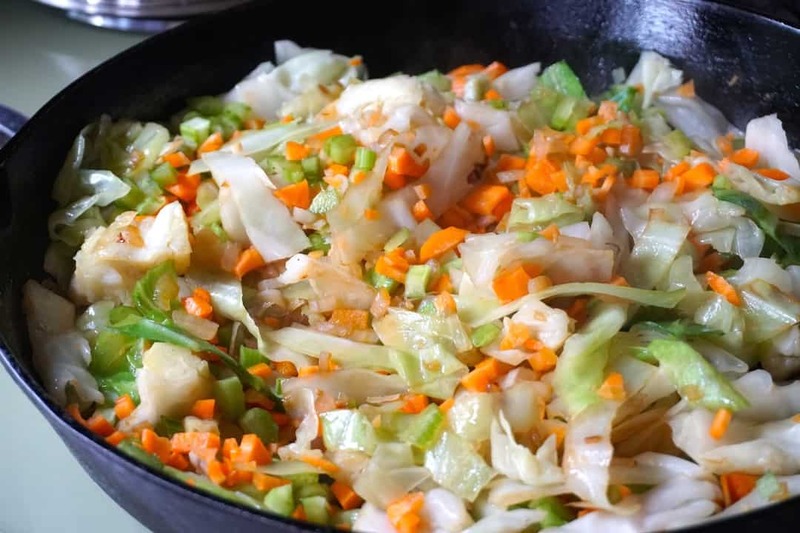 Stir in the carrot and celery cover and cook for an additional 5 minutes. Add the stewed tomatoes, marjoram and a pinch of salt. Stir everything together and add the sauerkraut as well as the liquid from the jar. Stir, cover and cook for 5 minutes. Stir in the beef. Adjust seasoning with salt and pepper, if you wish. Spoon on a bed of the cooked rice and garnish with sour cream and a sprinkle of chopped chives. 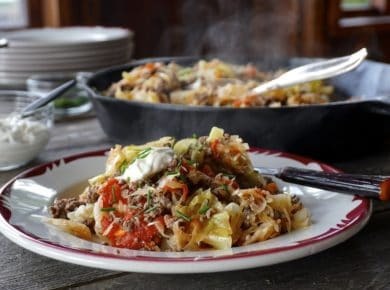 Forget all the fuss – if you need a quick dinner idea, these DECONSTRUCTED CABBAGE ROLLS should be on your roll call! 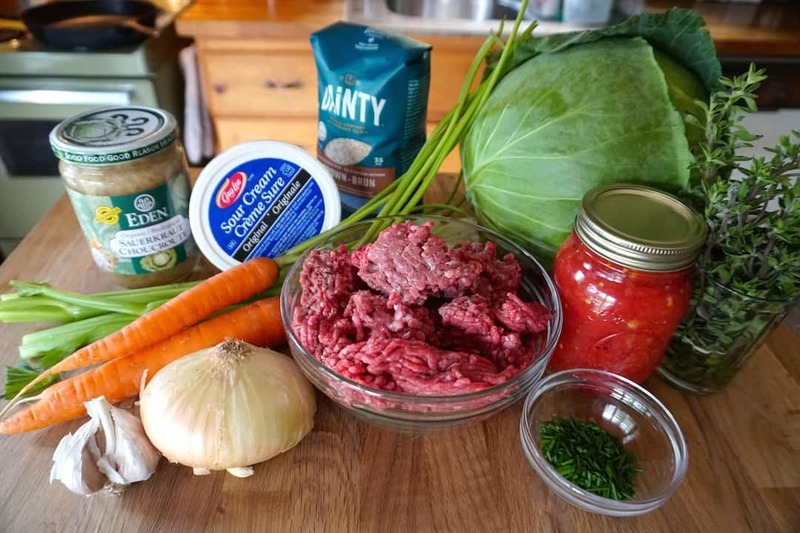 No jokes – this post for DECONSTRUCTED CABBAGE ROLLS all started with a bottle of sauerkraut. I spotted it on a refrigerated shelf in my supermarket’s deli section and the wheels started turning. How about sauerkraut with thick-cut double smoked bacon? Maybe I could sauté it with beans, onion, and apple as a tangy vegetarian side? How about I make our CLASSIC REUBEN SANDWICH? 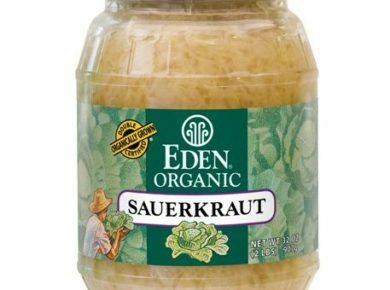 I started thinking about what I love most about sauerkraut, its pleasing, sour, pickled taste. Standing in the market, mouth-watering, it hit me – I want a cabbage roll, like right now! And with that inspiration top of mind, I figured this recipe out while driving back to the cottage. Before I list the various components, I’d like to suggest two things: head HERE for the very informative WIKI article on sauerkraut and also make sure to also check out the AMAZON LINKS at the bottom of this post, as I’ve listed a fermenter (DIY sauerkraut!) as well as my two favourite brands of sauerkraut. Better buy extras because you’ll be making this recipe again, trust me. There’s nothing too difficult about this ingredient list, but if you’re lucky enough to have homemade stewed tomatoes on hand, I definitely recommend using them. 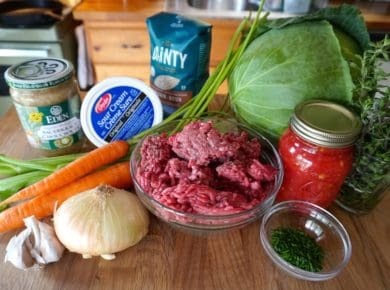 Although I made the recipe using ground beef, feel free to try it with ground lamb or pork, or make some light cabbage rolls with ground chicken or turkey. Just remember to shoot us a pic of your finished dish to info@weekendatthecottage.com or post it on your fav socials using #weekendatthecottage. We wanna see! 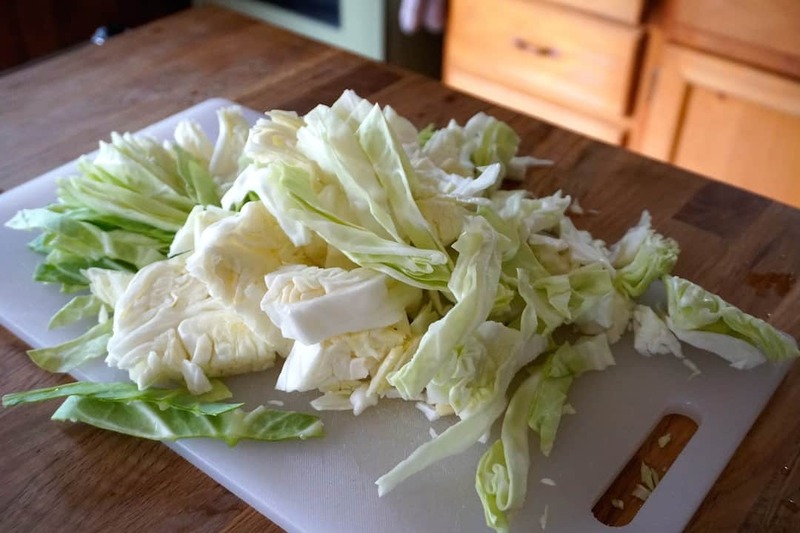 The recipe calls for about 2 cups of roughly chopped fresh cabbage, which equals about ¼ of a head. Sometimes supermarkets sell half heads, which is thoughtful. We suggest buying the entire cabbage and using the remaining quantity to make our CREAMY COLESLAW a few days later. I’ve come to understand that the absolute best cabbage rolls are made using fermented cabbage leaves. These flavour-packed leaves are soft enough to be rolled and sour enough to envelope and enhance the centres of the rolls. Using sauerkraut in our lazy cabbage rolls creates that same dynamic flavour profile we expect, but eliminates the task of rolling. It also brightens the flavour of the garlic, onion, and tomatoes so the entire dish is a win. Since we’re on the topic of serious flavour, please follow my lead and serve this dish with a dollop of sour cream – you can also substitute yoghurt if you’re in a jam. These creamy dairy enhancements, both sour in their flavours, add a pleasing silky texture to the dish. Try it and see. 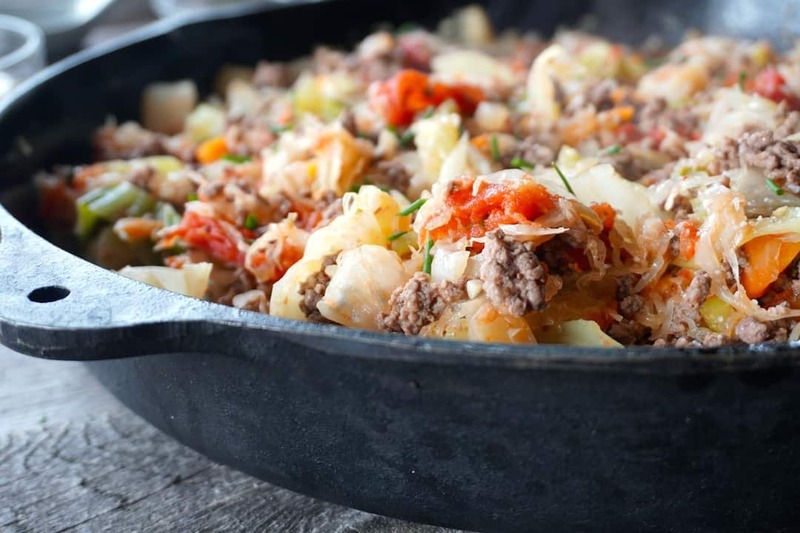 I love serving this meal straight from the skillet; it keeps things relaxed and also makes for an extremely easy service. I also suggest having sour cream and finely chopped chives at the ready. 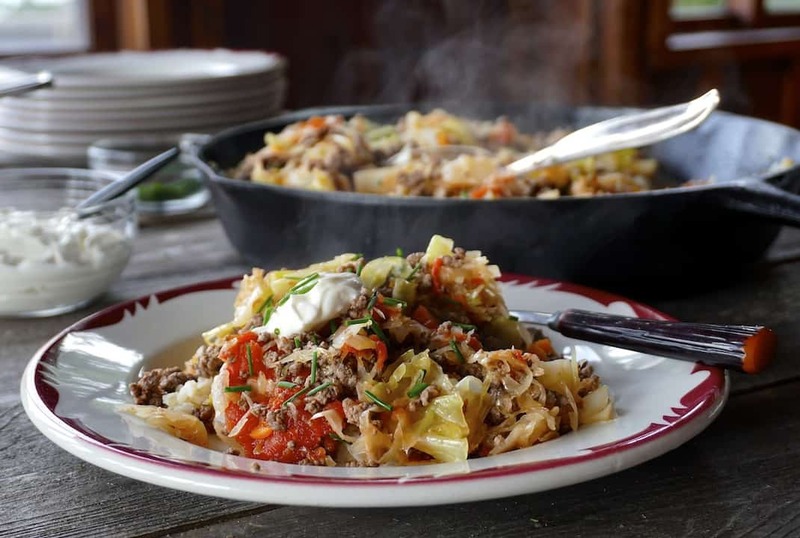 Spoon your DECONSTRUCTED CABBAGE ROLLS onto attractive plates, garnish and you’re good to go. If you have really hungry folks in your midst don’t be surprised when everyone asks for seconds. Although we’re suggesting this as a complete meal idea, you may wish to add additional items into the mix like our easy to prepare RAPINI WITH LEMON AND PARMESAN or BEANS ALMONDINE. For dessert, something equally easy like our MARASCHINO CHERRY POUND CAKE. 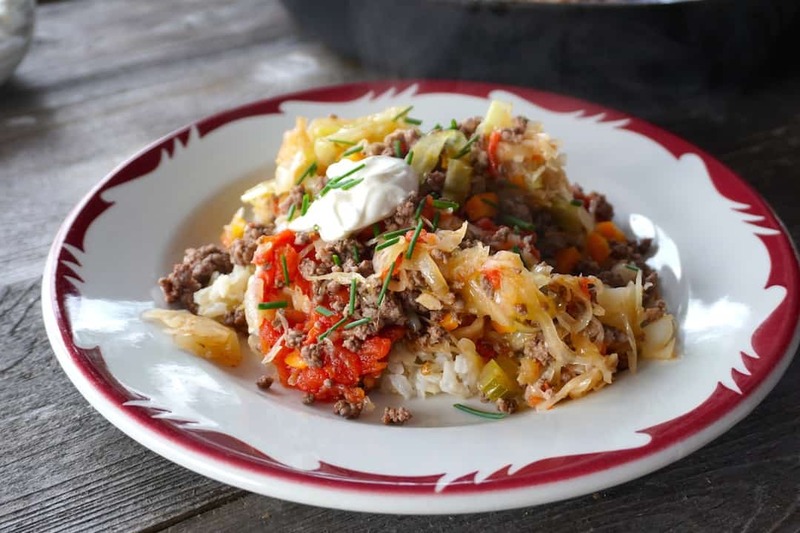 Make these DECONSTRUCTED CABBAGE ROLLS and bring your family and friends together for a meal they’re sure to enjoy. Bon Appétit! 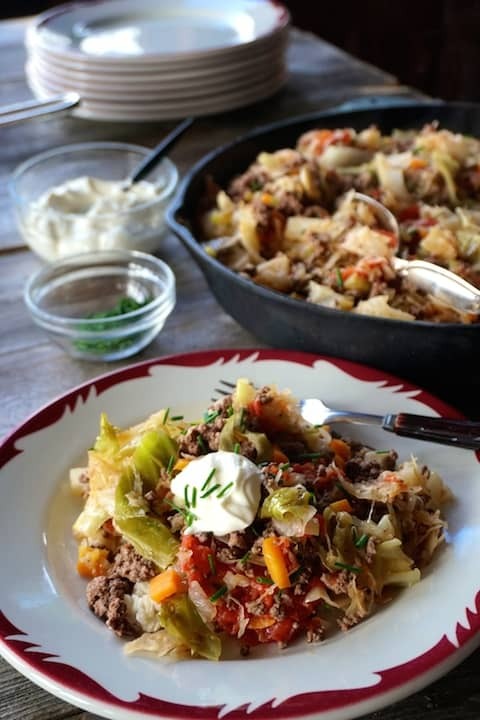 We love this recipe- it’s reminiscent of traditional cabbage rolls with less work. We will make it regularly. Thanks for writing in Marie! We really appreciate you giving it a try… so delicious!!! !